This exciting new book is unpublished work from the archive of the late Paddy Griffith. Paddy Griffith (1947- 2010) was a leading British military theorist and historian, who used wargaming as part of his tool set to critically analyse operational and tactical military history. This book includes two previously unpublished Counter-INsurgency (COIN) wargames from 1976 to 1980 and an example of a British Army live-roleplaying COIN from 1980. Paddy Griffith examined COIN situations using wargaming as part of his professional work, which included being a lecturer in war studies at the Royal Military Academy at Sandhurst. This book includes previously unpublished material from his archive about three such exercises. The first COIN game, Longreagh Village, is about a security force base facing a particularly challenging week of supporting the local police in a border village. Briefings are provided for the security forces and the opposition group. This is supported by a sketch map, intelligence files and a breakdown of activities for each day of the week. The second COIN game, summer in Dogem-on-Sea, is set in ORANGELAND. The local police are facing a two pronged threat against the local population. The security forces part of the game was run as a committee game, whereas the opposition side was run as a role-playing game. Detailed briefings are provided, the events diary of the local police commander, tactical sketch maps of key locations as well as other background material. The third COIN game is an outline of a British Army live-roleplaying exercise, with a cast of 250 people. Soldiers and civilians were drafted in to create a backdrop for an intensive 48 hour exercise to allow the officer cadets of Sandhurst to gain practical experience of COIN. As a lecturer in war studies, Paddy Griffith contributed to these exercises, in particular, the development of the exercise narrative. This book is almost unique in providing detailed historical examples of COIN exercises and as such is a window into the professional perspective of the British Army into COIN at that time. The foreword is by Brian Train, a well-known current game designer, who specialises in producing games about irregular warfare. The History of Wargaming Project aims to document the development of wargaming, including professional wargaming. Counters for COIN games- these are reproduced from the Sandhurst Krieggspiel (one of the professional wargaming books). The review was first published on Pax Sims on 19/9/16 and is reproduced with permission. Paddy Griffith—military historian, lecturer at the Royal Military Academy at Sandhurst, hobbyist, and founding member of Wargame Developments— was an influential figure in the evolution of British wargaming. In this volume, John Curry and his History of Wargaming Project have collected together materials from two counterinsurgency (COIN) simulations that Griffith developed in the late 1970s, as well as the outline of the main components of a live action exercise. 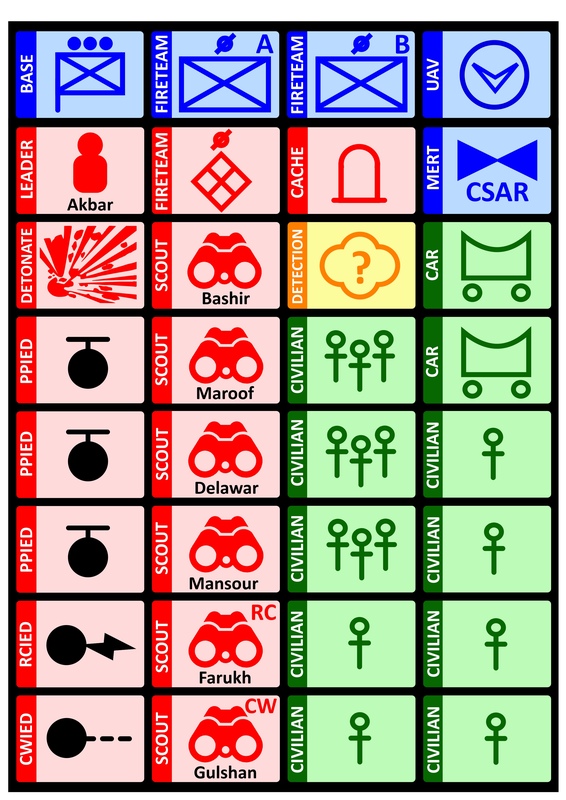 Prolific COIN wargame designer Brian Train provides a Foreword to the collection, placing the wargames in the broader context of developments in counter-insurgency doctrine and practice. If the first game, LONGREACH VILLAGE (1980), looks rather like a fictionalized British Army and Royal Ulster Constabulary hunting for an IRA active service unit in a Northern Ireland border village—well, that’s hardly surprising, for such was the counterinsurgency challenge that would be faced by young British officers at the time. Today, when most insurgencies and COIN wargames alike involve underdeveloped and failed states, it may all seem of marginal relevance. After all, this is not a setting where there are major impediments of poverty, language, or cultural understanding. Instead the background materials outline the milkman’s daily routine, the opening hours of the pubs, banks, and shops, and details of the local farmers’ market. However, in doing so the game provides an outstanding example of the sort pattern-of-life analysis that underpins local intelligence collection and tactical patrolling in almost all peacekeeping, COIN, counter-terrorism, and stabilization operations. This is something that—with the notable exception of Jim Wallman’s BARWICK GREEN game—is almost completely absent from modern wargames on the topic , which focus instead on either local armed clashes or larger-scale operational and strategic issues. Is Mr. X acting suspiciously, or is he they simply eccentric? Is a meeting in the pub a benign collection of friends, or a plot in progress? Where can you best position an OP to observe civilian (and possible insurgent) activity without being spotted? Where should vehicle checkpoints be established? What sorts of information should you be collecting? Who might be hoarding precursors for IEDs and other weapons, and how would you know? The border village of Longreach. 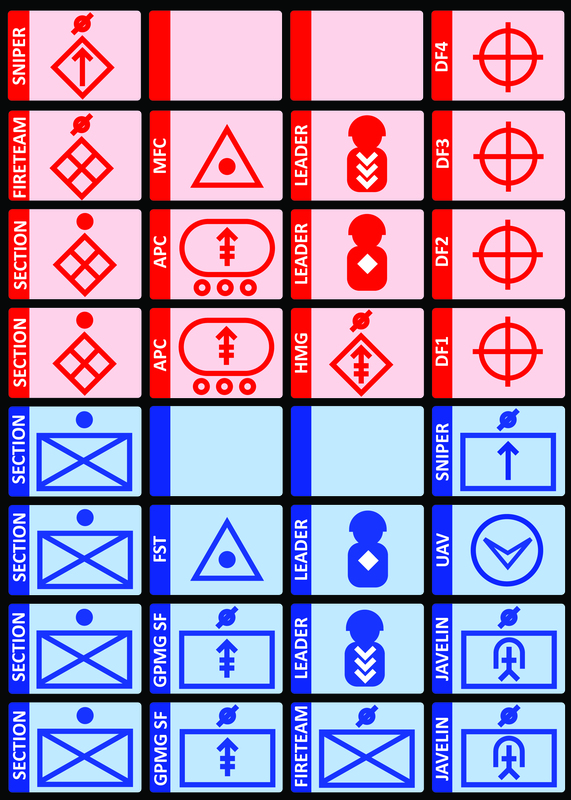 The wargame is largely played by having the Security Force and Red Cell players allocate personnel to missions, schedule their various activities, and plot their locations or routes, with the umpire then adjudicating the outcomes. The book also contains some brief suggestions for resolving some activities on the tabletop. Supporting materials include a map of the village, background information on the villagers, a list of daily routine activities, as well as the assets available to the Security Forces and Red Cell. The second COIN exercise is SUMMER IN ORANGELAND, which envisages possible terrorist activity by the “People’s Liberation Army” in the fictional town of Dodgem-on-Sea. Any resemblance here to IRA cells (or perhaps 1970s era leftist terrorists) operating in the mainland UK would not be coincidental. In this case the primary government actor is the local police force which, in addition to dealing with a possible terrorist cell, also has to cope with a busy schedule of other challenges: planning and security for the summer carnival, a football final, a concert, gold bullion shipments, and even a royal visit. The terrorists—some of whom have decidedly Irish surnames—must plan and execute a plot before they are discovered. In typical Paddy Griffith fashion, there are a few curveballs and eccentricities to keep the players on their toes. The final exercise, GREEN HACKLE, is a series of live-action tactical vignettes to be carried out over three days by approximately 250 Sandhurst cadets operating in a mock-up village training area. The book contains a list of scripted events, plus some photographs. Altogether, this slim volume provides fascinating insight into British counterinsurgency training in the 1970s and early 1980s. Moreover, the first two games highlight key challenges of tactical intelligence and analysis that remain highly relevant to contemporary COIN, counter-terrorism, peacekeeping, and stabilization operations. They are easily adapted or modified for classroom use, or could provide the inspiration for similar sorts of wargames set in other, rather different, political and cultural contexts.